The new platform can extend the smart home into the yard and enable sensors to run for more than 10 years on a coin-cell battery. Sigma Designs is showing off the latest generation of its Z-Wave mesh-network technology at CES. The company says its Z-Wave 700 platform will enable a new class of smart home devices that can be used outdoors, thanks to improved range of up to 300 feet, and in hard-to-reach places or even furniture, thanks to the ability to operate on a coin-cell battery for up to 10 years. In an interview with Sigma Designs’ Johan Pedersen, the Z-Wave product marketing manager predicted that sensor devices would soon become the highest volume category for Z-Wave devices. But the low-power architecture will also be of great benefit to larger devices, such as smart deadbolts, that must also operate on battery power. The most significant change in the Z-Wave 700’s architecture is a move away from the 8-bit Intel 8051-compatible foundation used in previous generations to a 32-bit ARM Cortex SoC (system on chip). Despite this shift, Z-Wave 700 parts will remain backward compatible with every other Z-Wave device since the platform’s inception more than 15 years ago. Sigma says there are now more than 2,400 Z-Wave certified devices on the market from more than 700 companies. 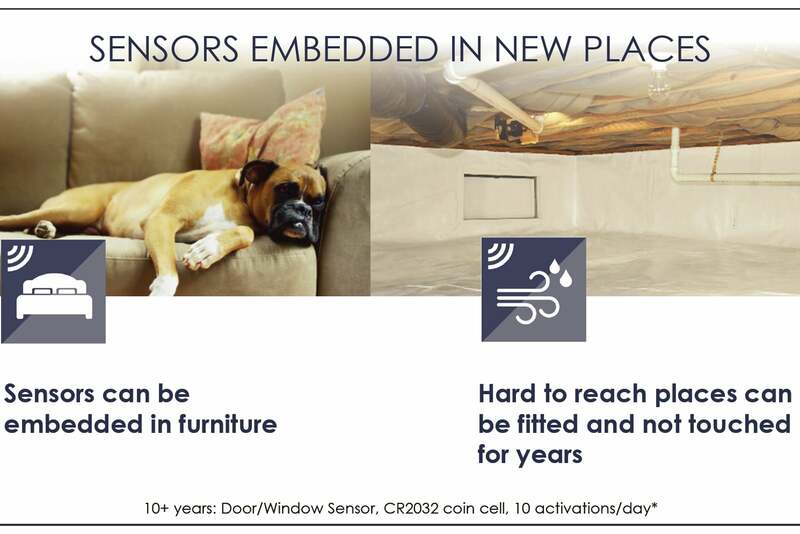 Sigma Designs predicts sensors will be the biggest growth area for Z-Wave devices, thanks to Z-Wave 700's improved range and power consumption. Sigma Designs’ SmartStart feature will be carried over to the Z-Wave 700. SmartStart eliminates the need to manually add devices to a Z-Wave network, they can be preconfigured to join a network as soon as they’re turned on, a feature that custom installers will appreciate most. Sigma Designs says Z-Wave’s robust S2 security framework, introduced at last year’s CES, will prevent devices from being hacked while they’re joining the network, a feature that will also benefit DIYers. Sigma Designs' Z-Wave Security S2 framework uses AES-128 encryption. Z-Wave and ZigBee are the two most popular technologies for the smart home and Internet of Things, but neither has been able to deliver a knock-out blow to the other because each offers a unique set of advantages. Where Z-Wave is limited to networks of 256 devices, for example, a ZigBee network can support up to 65,000 devices. And while ZigBee products must share radio spectrum with Wi-Fi devices in the 2.4GHz range, Z-Wave chips communicate in the 908MHz frequency band—that’s one of the reasons that Z-Wave chips consume so much less power. With Sigma Designs in the process of being acquired by Silicon Labs, a big player in the ZigBee market, we could eventually see chipsets that support both platforms. As it stands, the Z-Wave 700 series won’t go into production until later this year, so it will be a while before real-world products that use it will come to market.